We are very pleased to announce the availability of our newest herbal tea, Yerba, which is used to make a medicinal and cultural drink known as Maté (pronounced mah-tay) whose roots can be traced back to ancient South American tribes. The tradition and ceremony of drinking Yerba Maté continues to this day across much of South America, unsurprisingly it is most popular in Argentina which is home to the majority of the Yerba plantations. Yerba is grown from seed here before being harvested; once fully grown the leaves and stems of the plant are blanched, dried and aged before finally being milled and packaged. When yerba was first discovered by early South American tribes in Argentine they referred to it as the drink of the gods and when the Spanish conquistadors arrived during the 16th century they also became enamoured with the herbal tea infusion. It wasn’t until the Jesuit missionaries arrived that yerba spread to other parts of South America and the secrets to the cultivating the yerba plant was discovered. 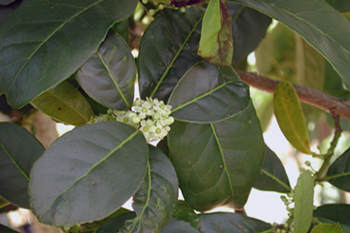 The Jesuits observed that to successfully grow the yerba plant the seeds had to first pass through certain species of birds and it was this knowledge that eventually led to wide scale cultivation of yerba on tea plantations. 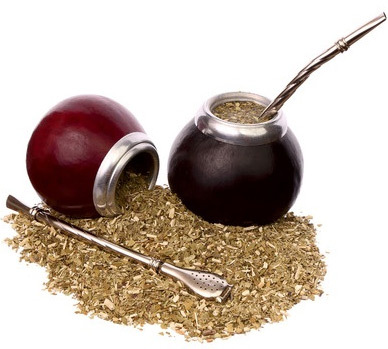 The traditional method of drinking mate remains very popular today across much of South America. A hollow gourd is filled with a large quantity of dry, shredded yerba leaves and hot water to make a very strong herbal tea infusion. The tea is then drunk through a metal straw and passed amongst friends. In some parts of South America hot mater taps are scattered about towns allowing the locals to refill their gourd as they travel around. Yerba tea doesn’t just taste great it’s also good for you! By stimulating the bodies digestive systems to produce greater levels of acids yerba mate tea improves digestion, cleans the colon and reduces stomach bacteria that leads to bad breath. With nearly twice the levels of antioxidants found in green tea, drinking yerba can boost the body’s immune system, aid in the prevention of several different forms of cancer as well as slow visible signs of aging. The amino acids and antioxidants found in yerba improve the cardiovascular systems ability to move fat and cholesterol though the body so they don’t accumulate and harden in arteries and the stimulant effect of yerba naturally reduce appetite and burn more calories. Drinking yerba tea regularly helps in the long term prevention of blood clots that can lead to heart attacks or stroke. The various vitamins, minerals, vitamins and polyphenols found in yerba tea have a calming and balancing effect on the body that purportedly increases mental energy and focus and despite containing caffeine reduces stress levels and help to prevent insomnia. Over time the nutrients in yerba affect the body’s metabolic processes leading to more efficient use of carbohydrates. In addition yerba can help stop acids collecting in the muscles which decreases the severity of soreness and aches after a vigorous workout.